Okay, since I've got like - what? - four hours until the end of time, I've got some things I've got to do. 1. Find Jason Morgan, my hot crush from General Hospital, and make it happen. Sorry dear, but in the event of pending global chaos, something about being in the arms of Jason, the mob's toughest enforcer, just makes it all seem all right. 2. I need to head to Noble Romans and eat my weight in breadsticks. If I make the rapture cut, not sure if they'll have those delicious dough sticks in heaven, and if I'm left behind, well, I'm not going to count on them being open through the apocalypse. 3. 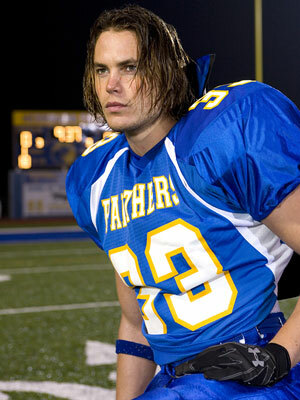 I've got to fit in the remaining episodes of Friday Night Lights - I can't face eternity not knowing if my beloved Tim Riggins ever gets sprung from the clink. 4. I must put on a fresh pair of underwear. Not sure why - ask my mom. She's the one who was always telling me that it was important to have on clean underwear in the event of an accident. I can just hear her now, "The rapture is this evening young lady, you'll want to make sure you're underwear are clean." I could be on the side of the road with blood gushing from my head and that woman would be worried about my underwear.